Heat oven to 400ºF. Put cups in 12-muffin cup pan. Beat milk, butter and egg in a medium bowl. Fill muffin cups ¾ full. Bake until golden brown (16 to 20 minutes). 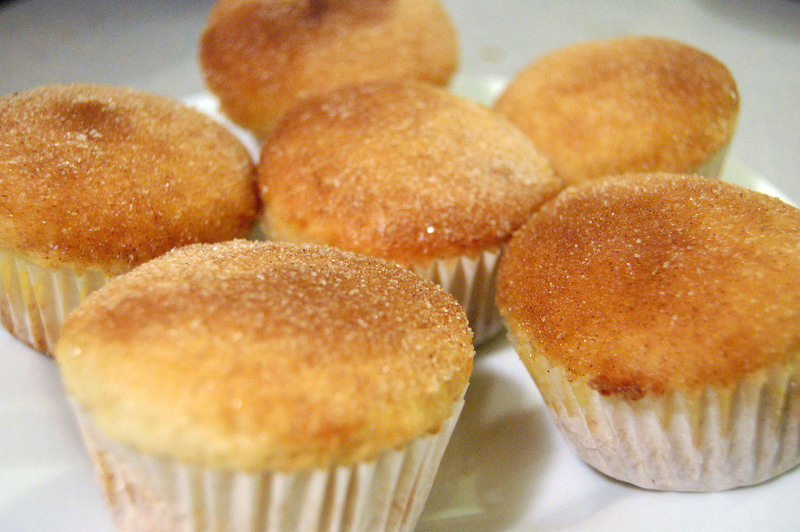 Immediately remove from pan and carefully roll hot muffin tops in melted butter, then in cinnamon-sugar mixture. Serve warm! Great recipe! I have made these myself and can attest to how addictive and delicious they are! You have such a nice looking blog and quite a number of good recipes-especially this one! Thanks for the invite. Hi, these muffins are marvelous.I love cinnamon. These look so good! Like donuts in muffin form! Wow these muffins look fantastic! Love anything with cinnamon and sugar. Yum! What isnt better dipped in butter and cinnamon. These sound like a great way to start the day. Yummy muffins! I made ones like this recently, and they were a huge hit. They freeze well! My 6 year old said they were even better the next day! Yummy…the cinnamon sugar topping is so appealing. A perfect little snack muffin there. I have no words…Well yes I do, YUM!! !